Fastest SuperSpray render? It is easy! How to optimize your scanline render for SuperSprays? Now I will try to answer. I will show you the settings I use. I use scanline render only. There are good reasons. But you can use any other render (VRay for example) for environment. But you should use scanline render for SuperSprays. Why? Firstly I render environment. Next I set rendered environment as background and render SuperSprays using scanline render. Is it clear I hope? :) Mail me if is not. So you can render environment using any render you like. But SuperSpray must be rendered using scanline render. First I set the frame rate. It is important to make before configuring of the fountain (SuperSprays). Otherwise, the settings will be distorted. 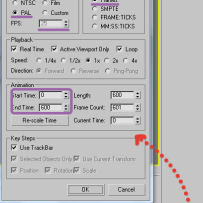 You can set the start and end frame of the animation. Press F10 and go to Common. 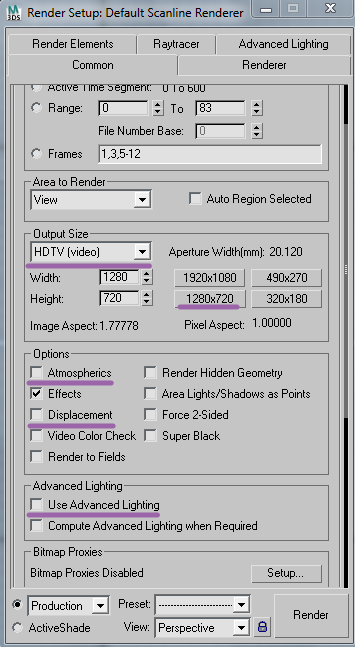 I set the Output Size is equal to HDTV (video) 1280x720. You can use another standard. But it is most popular. This quality is enough for ALL of my clients. No one asked to change. 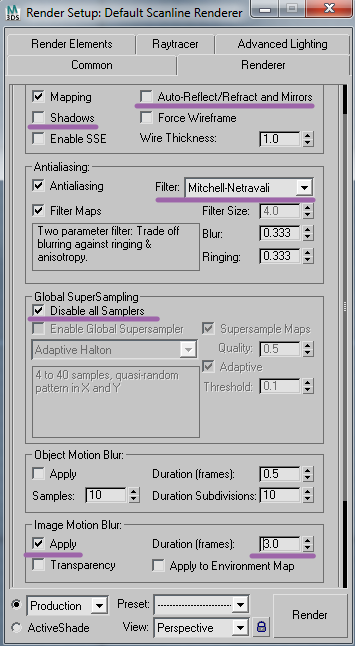 Remove all the excess In the Options group except Effects. This is necessary for Glow effect around the jets of the fountain. It looks very nice. Remove Use of Advanced Lighting in Advanced Lighting group. We do not need such luxuries. Go to Render tab. Turn off Auto-Reflect/Refract and Mirrors - if you can without reflections. It is saves rendering time. Turn off Shadows. I am totally against shadows. It is extremely hard for you PC. Mitchell-Netravali filter will add contrast. It is antialiasing filter. Turn on Disable All Samplers. Super Sampler is not good idea in this case. Object Motion Blur is hard for your PC. I use it rarely. I use to Image Motion Blur. It gives a good result. I like to make jets a little more blurred. It adds to the realism. So I set the value equal three. Raytracer tab. 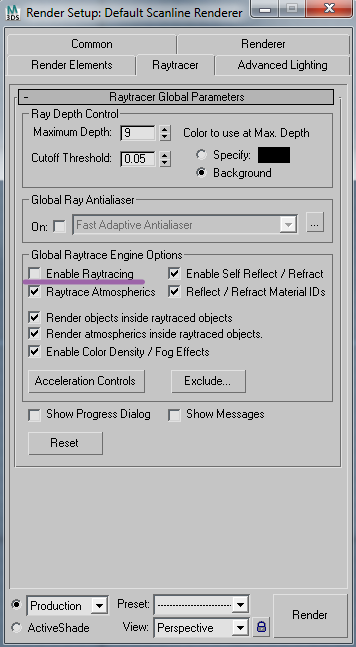 Turn off Enable Raytracer. Waste of resources in this case. 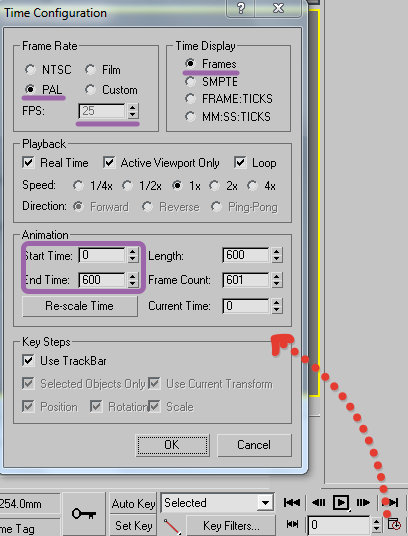 So it is took about one second for each frame if the background is static. It is a very fast and convenient. You can quickly make changes in the finished animation. A little bit harder if camera is moving. We need fix wrong motion blur of injectors. But this is a topic for the next lesson.